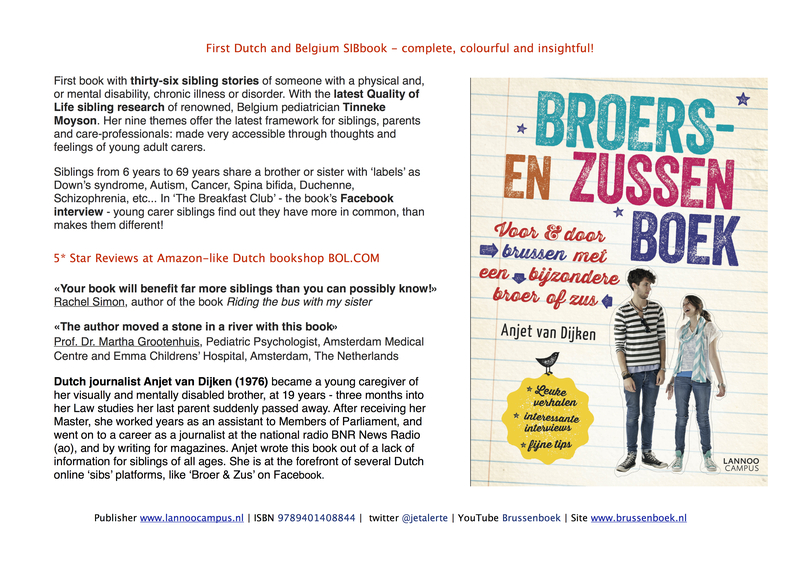 The first Dutch sibling book is filled with 36 inspiring stories of brothers and sisters of children who need extra care due to a (mental) illness or disability. The ages of the siblings are between 6 and 69 years old. So directly the most complete book too! Colourful and magazine-like presented, with even a Facebook interview with the 13-26 year olds. AS A SISTER of a visually and light-mentally disabled brother, I felt the need for a book for people of ALL AGES, who grow up in a special family, or know a son/daughter/brother/sister with a special ability. EXPECT inspiring stories by siblings about what it is really like growing up in a care-intensive family, with expert’s advice and fun drawings that will depict ordinary situations in these families, that everybody – young or old – can connect to and discuss, if needed. FOCUS will be on the interpersonal relationships: what is it really like to live in a family in which one naturally needs more attention; what is different and what is the same; and, what insights and inspiration did it give the sib for the way they chose to live their life? And of course also: how did they find their balance; what was the role of their network, and (how) did they talk about their thoughts for their future and their brothers’ or sisters’? The books’ GOAL is to inspire siblings as well as families to find their balance as a family and as a person in this family and later. For all OTHER readers: it will not only be a very insightful book into the lives of a beloved family, neighbour, colleague, and insightful on questions you may have been meaning to ask for a long time but were afraid to ask, or did not know how to ask. Want to CONTACT me about this project or want to have the book translated in English/French? Do not hesitate and drop me a line!